Mount Michael students participate in a variety of mathematics & science competitions throughout the school year. In Math the competitions include: UNL Math Day, AMC 10/12, and Wayne State Math Competition. In November, the top math students travel to the University of Nebraska-Lincoln to compete in the UNL Math Day. Over 1300 students from across the state compete as a team on a written exam as well as a quiz bowl competition. Mount Michael has regularly won their division. In February, students are given the opportunity to compete in the American Mathematics Competition. Our students compete against students worldwide. Lastly, in May, select students travel to Wayne State to compete in Algebra, Geometry, Algebra II, Pre-Calculus, and Calculus. 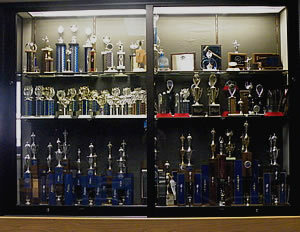 The Knights are a perennial power in Math and Science competitions and have a packed trophy case to show for their efforts.